I met a chap in Slovenia this summer. His wife is a spy but I’m not sure how good a spy she is. Not a top secret one for sure. He has retired from a very dull sounding IT type job and in between preparing Marks and Spencer ready meals for his spy he likes to escape for short periods when he has earned enough brownie points and take on various outdoor type challenges. I didn’t realise that the Slovenia trip involved one of these aforementioned challenges. I just thought it was a trip to the mountains with the prospect of some amazing views. I think I was right, although we did climb quite a big hill, which offered even more spectacular views. Anyway, my new acquaintance expressed an interest in heading North to re-visit the Three Peaks that he had conquered ‘as a lad’ and as I live close by provided a convenient base for his little romp into the fells. I persuaded him to bring his bike as well as his boots in the hope that a two wheeled viewing of the three glorious peaks from a variety of angles may sate his appetite for the hills and save him, and his reluctant hostess, 25 miles of bog, mist, board walks and possible half term crowds. I love all three of our infamous peaks but have tackled them on enough occasions to know that a wet October following a wet September is not the time to see them at their very best. And so it was that our road trip round the hills began. The route was designed to offer 360-degree views of all three peaks and tire his Southern legs out to such an extent that he would find the thought of donning his walking boots the following day a most unpleasant prospect. I was lucky with the weather. The sun was shining enough for us to see all three hills, but there was just the right amount of cloud to make them look especially dark and imposing. The ride began in Malham with the first climb straight off the pages of the ‘top 100 hills’ – someone’s opinion of the 100 best hills to climb on a road bike in the UK, someone with a lot of spare time. Needless to say this first hill, the Cove Road warrants it’s place as a legendary climb. With the Cove on our right the road winds ever upwards towards the limestone topped fells and Ewe moor. My friend took the lead and determined to prove he was no Southern Jessie set off at great speed. Yours truly, forever tale end Charlie, plodded slowly to the summit but I think arrived slightly less red faced and jelly legged than our new friend. The route then crosses Malham Moor with the Tarn behind us, Wharfedale to our right and Ribblesdale ahead. We made our way to Stainforth battling through a head wind and should have had our first real sighting of Penyghent. However, the hill was completely swamped by thick cloud – a sign, I thought (and dearly hoped), that October is a month to leave the summit in peace to recover from the summer hoards. Stainforth is a lovely, tiny village very close to a famous salmon leaping viewing spot at the Foss on the River Ribble – a visit well worth making at this time of year. No time for us to watch these amazing fish leap to incredible heights again and again until they leap high enough to scale the limestone outcrops and waterfalls to forge onwards upstream. Instead we headed into a now ferocious headwind to Horton for an early mug of coffee and toasted teacake. 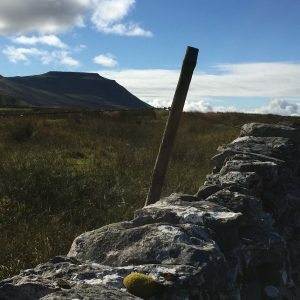 Horton is the starting point for most walkers attempting the Three Peaks and is usually throng with boots, rucksacks and map wearing crowds eager to bag the three hills in an allotted time checking in and out of the buzzing little café to get their card stamped as proof of their accomplishment. 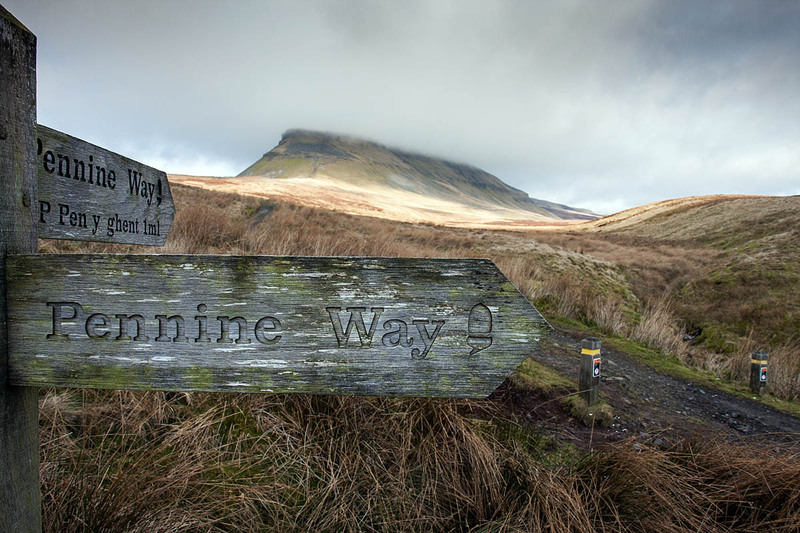 Today there were a few hardy souls and although we now were privileged with the odd fleeting glimpse of Penyghent, most adventurers were occupied elsewhere. Suitably refreshed we headed gently upwards to Ribblehead. Even the ever-present tea van, which seems to be permanently parked on the verge overlooking the impressive viaduct, was on annual leave. 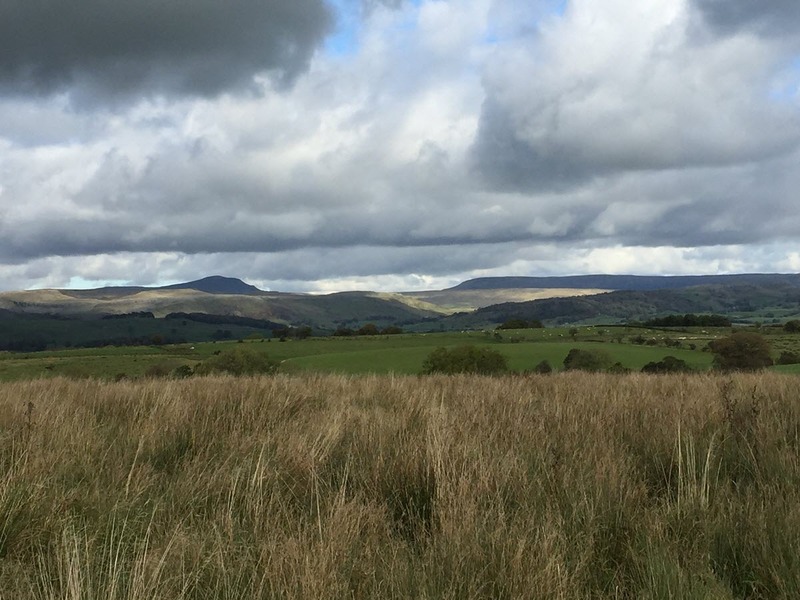 Whernside ahead, Ingleborough to our right and Penyghent to our rear – on a clear day there is no better place to view all three peaks. Today they occasionally emerged from the clouds and allowed us to see them in their full majesty. I always think the hills look more impressive in bad weather and was happy to be on two wheels looking up at them rather than in boots and gaiters struggling through misty rain and wind to their summits. 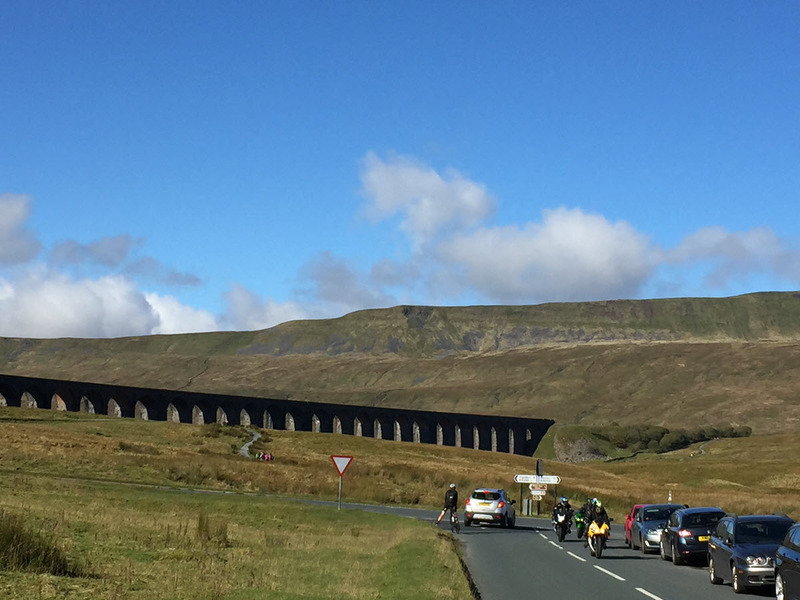 Ribblehead is a well-known beauty spot and also a well-known rendezvous place for very loud motorbikes so I recommend cycling this route on a weekday and avoiding it on weekends, unless you enjoy the thrill of roaring machines skirting your legs at astonishing, terrifying speeds. At Ribblehead we take a left towards Ingleton and after about a mile turn right to Chapel-le-Dale. The road takes us through the tiny hamlet and is virtually car free all the way to Ingleton. 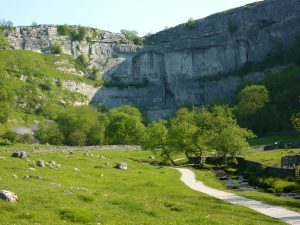 It is a beautiful part of the route with limestone outcrops on one side and Ingleborough on the other. Today there were waterfalls cascading off the fells adding to the already splendid views. Once in Ingleton we resisted temptation for further refreshment and crossed the A65 and made our way out to Wennington and Wray. This area is less well known amongst tourists and affords a quiet hidden gem off the beaten track. The hills are a little less severe but the views no less spectacular and on a good day the Langdales can be seen in the distance. Having recovered from the Malhamdale hills and the gentle but persistent climb to Ribblehead, my friend from the South found a second wind and powered ahead to our lunch stop in Wray. I’m not sure that he was accustomed to the narrow Yorkshire and Lancashire roads and on several occasions wobbled precariously in front of large tractors and I worried that I would be interrogated by the spy when he ended up in Lancaster Infirmary. Happily he avoided that fate, survived beans on toast in Wray and was raring to go on the homeward straight. The final part of the journey is one of my favourite cycling routes. 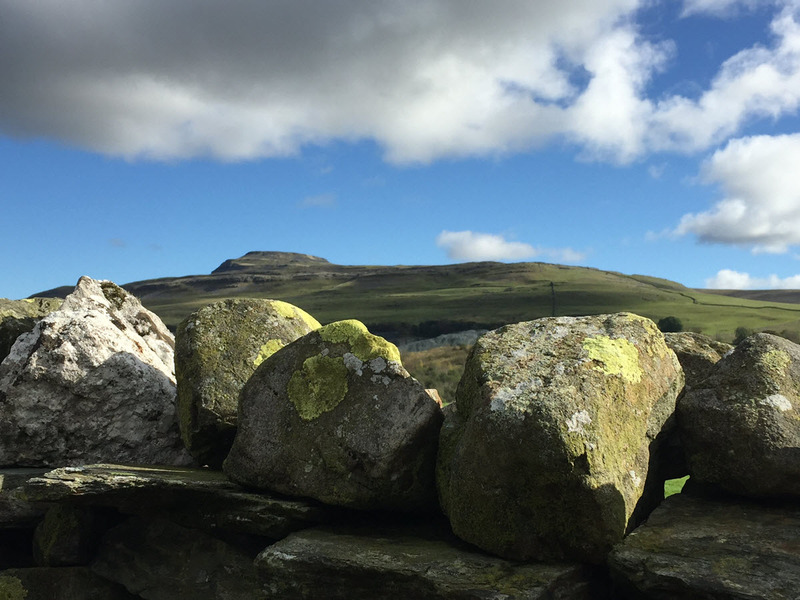 The back road from Wray to Settle, skirting above Bentham, and going through Eldroth offers views of all three peaks from a completely different aspect. It winds past farms, through open country-side, through the pretty hamlet of Eldroth and past the massive gritstone Norber Erratics. At all times the three peaks can be seen and you get a proper perspective of the distance between each and the challenge the walk poses. My friend did not seem especially interested as his three tour guides went to great lengths to explain which peak was which. He was more intent on proving his cycling prowess and forging ahead, tackling each hill with huge gusto and determination. We had warned him that there was one final challenge, another climb that was worthy of the ‘top 100 hills’ but I think the jelly-legged feel of the Cove Road was a distant memory and so he left Settle via the cobbled road and attacked ‘High Hill’ like a Tour-de-France pro. I can’t say that I love this hill. I can tell you that there are 14 telegraph poles in total and could probably describe most of the tarmacked surface in great, very boring, detail. It is a killer hill. Our friend from the south soon found that it was not a hill to be messed with and a hill that needs tackling at a steady pace if a cardiac arrest or spontaneous dismount is to be avoided. To give him credit he did make it to the top. However, he was most definitely what I believe can be termed as ‘broken’ and took an unprecedented long time over the following 5 miles that brought him back to the start of the ride. He blamed the highland cattle that enjoy stopping traffic on Settle moor but from the look on his beetroot red face when he stumbled through the door, I think we can blame the vertiginous climb out of Settle. 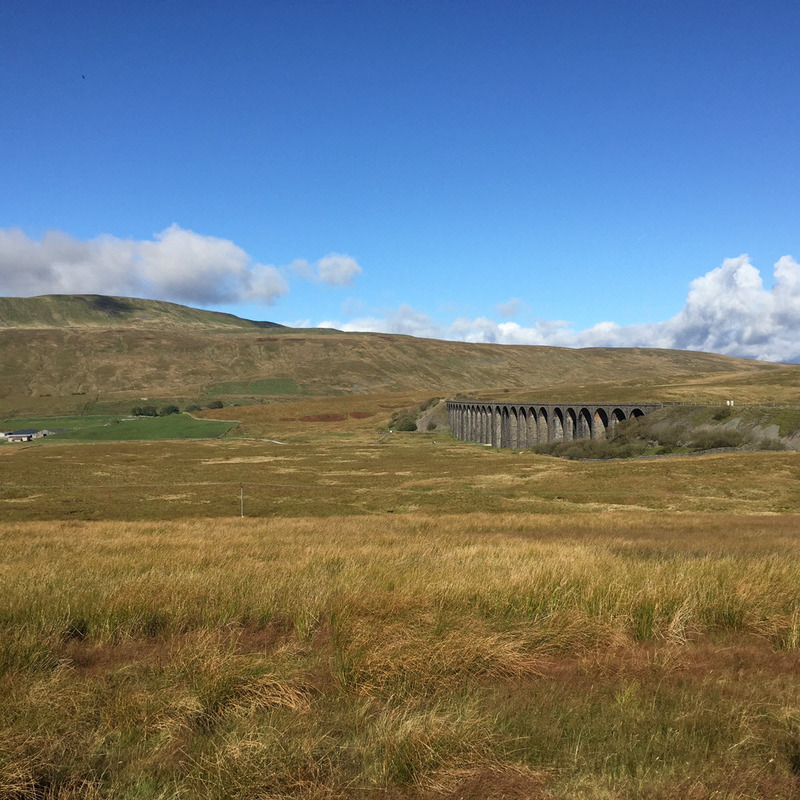 I’m not sure how much my guest appreciated the alternative views of Penyghent, Ingleborough and Whernside but I can highly recommend the route if you wish to see them from two wheels or four and don’t fancy tackling them on foot. As for my friend, undeterred, he did set off the next day to complete the challenge that he set himself in Slovenia. I set him on his way up Penyghent and gave clear instructions as to where to go at the summit. He conformed my suspicions that he listed to little that I said and spent quite a long time battling through bogs having turned right to Plover Hill instead of following the motorway footpath back towards Horton. The dog and I were happy with our short foray half way up Penyghent and even happier to return home to keep the kettle warm for the return of our guest, happy in the knowledge that the hills are going nowhere and are often best viewed from lesser known vistas.